The lot located at 412-418 South Sanford Avenue in Georgetown, an historic African-American neighborhood in Sanford, Florida. The earliest known residents of this lot were both African Americans: Randall Turner in 1911 and Gilmore Felder in 1917. In that same year, Turner was also listed as resident of 410 S. Sanford Ave. By 1924, Felder had moved across the street to 413 South Sanford Avenue. In 1926, J. W. Williams, a black businessman, ran his restaurant from this address. This building was listed as vacant in 1947, but became occupied by Everybody's Hardware and by Sylvester Tavern, another black-owned business, as late as 1952. Cave Tavern was located here in 1965. The first known occupant of Suite 414 was Leamon Gaynor, an African-American barber who ran his business from this location in 1926. He had previously had his barbershop at 405 S. Sanford Ave. Between approximately 1947 and 1952, this lot was vacant. In 1965, Knights Bicycle Shop was located at this address, but moved to 303 South Sanford Avenue by 1975. The earliest known occupant of Suite 416 was Morris Cleaner & Dryer in 1926. Morris Narvis, who operated his clothing trade at 320 South Sanford Avenue in 1924, was likely the owner of this business. Black businessman Robert Burns was listed as a resident at this location in 1947. He also owned a beer store at 316 S. Sanford Ave. during that same year. Rainbow Pool Room was also listed at this address in 1947. By 1952, this lot was being occupied by Metz Shoe Shop, an African-American business. From approximately 1965 to 1975, the business operated from 422 S. Sanford Ave. under a new name: Metz Shoe Shop Repairs. It is likely that this business was owned by William Metz, a cobbler who operated his business from 321 South Sanford Avenue in 1947. In 1965, Ansley TV Service was located here, but later moved to 400 S. Sanford Ave. by 1975. In that same year, Williamson & Son Barber Shop occupied this lot. Druggist A. M. Staup was the first known occupant of Suite 418 in 1926. 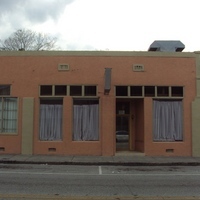 The Seminole Barber Shop occupied this location from approximately 1947 to 1952. The barbershop, owned by Preston Williamson, moved to 420 South Sanford Avenue by 1963 and remained there until 1969. It is likely that Williamson & Son Barber Shop was owned by Preston Williamson as well. The address was listed as vacant in 1965. In 1975, Steen's Dry Cleaners was housed here. The building was also previously occupied by Beverly's Hair Cutting. In 2011, the building was being occupied by Miracle House Healing Ministries, Inc. a non-profit religious organization established on November 1, 2003. The organization is operated by Thomas and Patricia Williams, who married on September 18, 2000. At the time that this photograph was taken in January 2012, these suites were vacant. Original color digital images by Adam Rock, January 23, 2012. Sanford, Florida City Directory, 1926. Sanford, Florida: R.L. Polk & Company, 1926. Sanford, Florida City Directory, 1952. Sanford, Florida: R.L. Polk & Company, 1952. Rock, Adam. 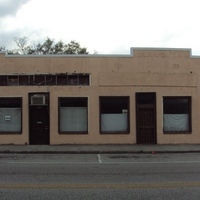 “412-418 South Sanford Avenue.” RICHES of Central Florida accessed April 20, 2019, https://richesmi.cah.ucf.edu/omeka/items/show/3691.